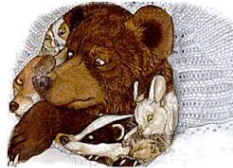 Our story this week is, The Mitten, by Jan Brett Click Here. Our song is The Freeze, click here We move until they say “freeze” then we stop our bodies like a statue. What is a baba? What do you call your grandparents? What is knitting, yarn, needles and wool? What is camouflage? This is a wonderful story for recall and sequencing. Who went in the mitten first, next, after that, last? This book is also rich in vocabulary: mole, tunneling, burrow, cozy, kickers, hedgehog, jostled, commotion, swoop, grumble, talons, badger, diggers, snug, waft, trot, drowsy, muzzle, lumbered, plumped, swelled, stretched, bulged, scattered, and silhouette. We will re-enact the story and stuff ourselves inside a cloth, not knitted mitten. Hopefully I will get some good photos. Don’t forget the LANGUAGE EXTENSIONS AT HOME to the right. Previous Previous post: Week 15- Review and Assess November 28th-December 1st.